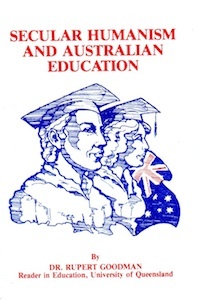 The Address titled "Secular Humanism and Australian Education"
was presented to Toowoomba Conservative Club, 1980. Dr R. Goodman – "In this paper I aim first of all to discuss various definitions of humanism in order to dis-entangle what to me are its essential components. Then I wish to show the relationship between humanism and educational philosophy, together with their fellow travellers. Finally I will relate secular humanism to developments in various aspects of education in Australia, pointing out the dangers and suggesting proposals for control and reform."